Judy's interest in the Decorative Arts began early. Annual family visits to Williamsburg, Jamestown, and Gettysburg, as well as to her Aunt's home near Valley Forge helped the interest take root.. It grew with her father, who built the house she grew up in...and her mother, a floral designer who owned a shop for more than twenty-five years where everyone dressed in colonial costume. For more than thirty years, she taught elementary students and later supervised the Gifted Education program; those years became her art. When her boys were in high school, however, she knew it was time to come home full time. As they began college she graduated as well, this time from Rhode Island School of Design with a degree in the decorative arts. 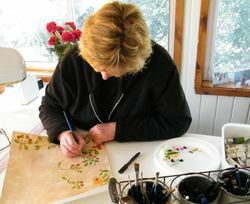 Judy's work is based on early american design and incorporates, watercolor, gouache, vinegar painting, graining, glazing, gilding and use of various pigments. By designing her own compositions, she is able to create one-of-a kind pieces. 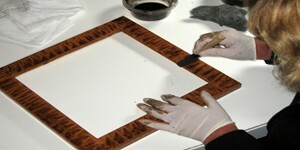 Her vinegar painted frames not only enhance the beauty of the paintings , but also keep their creation in period style. For the past eleven years, she has been fortunate to have been selected by Early American Life as one of only 200 craftsmen chosen for demonstating mastery of her craft, but also for honoring time honored tradiitons in creating it. 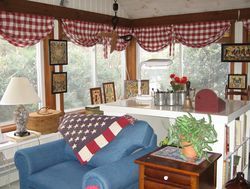 She has been featured in Early American Life Magazine, Cape Cod Life, and The New England Showhouse Magazine. Her work is offered in shops, including beautiful Nantucket, where her originals are sold. For the past thirty two years, Judy and her husband have lived in a 160 year old New England farmhouse. Judy's studio is nestled among pines and old stone walls. "We all see the world differently," Judy says, "and I continue to be amazed about we each create. For more than thirty years, teaching was my inspiration and my love...But now...This is my world...The outdoors, my canvas..and each day...I wake up to inspiration."